The location is in between Minneapolis and St. Paul which makes driving convenient. These roads and I35W get you to most of the attractions in the Minneapolis/St Paul area. St Paul instead of any hotel staff. Very spacious and quiet surroundings. Nice tall ceilings and big windows. Property was clean staff was friendly and had a great restaurant. Where to find St. Paul hotels near an airport? How can I find hotels in different St. Paul neighborhoods? Where can I find hotels in St. Paul that are near tourist attractions? Short- and long-stay accommodation choices are many and varied in St. Paul. Expedia's extensive and up-to-date database lists 20 places to stay within a 0.1-kilometre (0.06-mile) radius of downtown St. Paul. Booking convenient accommodation in central St. Paul is only a mouse click or two away. Expedia's up-to-the-minute booking page features the The Saint Paul Hotel and Embassy Suites - St. Paul, which can be found a short distance of the town center. A convenient option when spending time in St. Paul is to stay close to the University of St. Thomas. Within driving distance are both the The Commons Hotel - A Noble House Hotel and the Best Western Plus Como Park Hotel. 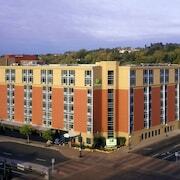 The Days Inn St. Paul-Minneapolis-Midway is a more economical hotel. It's nicely positioned 7 kilometres (4 miles) from the center of St. Paul. If you are after another budget option, you could look into the Motel 6 St Paul I-94. 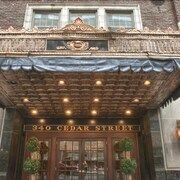 14 kilometres (9 miles) away from the center of St. Paul, is the Hotel Ivy, a Luxury Collection Hotel, Minneapolis. The Residence Inn By Marriott Minneapolis Downtown is 15 kilometres (9 miles) away. The Loews Minneapolis Hotel as well as the The Westin Edina Galleria are other alternative Expedia-listed accommodations around St. Paul. 19 kilometres (12 miles) to the southwest of St. Paul is Bloomington - Mall of America, where visitors can enjoy Normandale Japanese Garden and Centennial Lakes Park. The Embassy Suites Hotel Bloomington and Residence Inn by Marriott Minneapolis Edina are some of the Expedia-listed hotel options in Bloomington - Mall of America. 14 kilometres (9 miles) to the west of St. Paul, is Downtown Minneapolis, home to the Residence Inn Minneapolis Downtown at The Depot by Marriott and Radisson Blu Minneapolis Downtown. While in Downtown Minneapolis, set aside some time to visit the Minnewaska Lake and New Century Theatre. Before you say goodbye to Minneapolis - St. Paul, why not make sure you experience some sport. Visit Xcel Energy Center to the southwest of St. Paul. Book accommodation nearby to the action at the Holiday Inn St. Paul Downtown or the InterContinental Saint Paul Riverfront. For those travelers planning on arriving via Minneapolis - St. Paul International Airport, you may like to book a room at Radisson Blu Mall of America, or Embassy Suites by Hilton Minneapolis Airport, both of which are nearby. What are the most popular St. Paul hotels? Are there hotels in other cities near St. Paul? What other types of accommodations are available in St. Paul? Explore St. Paul with Expedia.ca’s Travel Guides to find the best flights, cars, holiday packages and more!